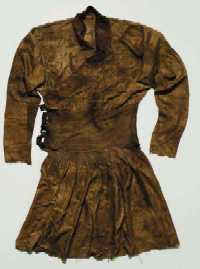 The next two coats under discussion are actually Mongol coats from the 13th or 14th century. They do however give us some insight into how such coats were made and the ways in which they were secured. This page has an overview of each coat and the following pages will give you more detailled information. The first coat is made of yellow silk. 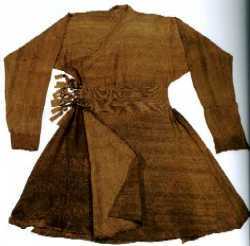 It is a typical Mongol robe of the thirteenth to fourteenth centuries. It was unearthed in 1978 and is in the collection of the Museum of Inner Mongolia. The robe is made of gold brocade patterned with rosettes within rhomboid lozenges. The lining has a design of back-to-back rearing lions with human faces. The robe folds to the right in front. The length from cuff to cuff is approximately 246cm (98 inches) and the length of the coat is 142cm (57 inches). It has many of the elements we associate with nomadic coats including the flaring skirt, the extra long sleeves and the crossover. It largely differs in two areas from Turkish coats. The first is it has a quilted section around the midriff. The second is the fact the the crossover is from left to right. If you look at Islamic manuscript illustrations preceding the 13th century (the Turkish years) you see the crossover as right to left, after the 13th century it is shown as crossing left to right (the Mongol years). During the 13th century you see the transition with both forms present in different illustrations and in some cases in the same illustration. A similar coat recently came up for auction at Christie's. It is slightlty smaller than the other but the proportions and layout are very similar. This coat is described as being a Mongol silk lampas weave robe from Eastern Iran or Central Asia. It is dated to the late 13th century or the first half of the 14th century. It measures 131cm (51.5 inches) from hem to neckline. Which would make the cuff to cuff length about 200cm (80 inches).